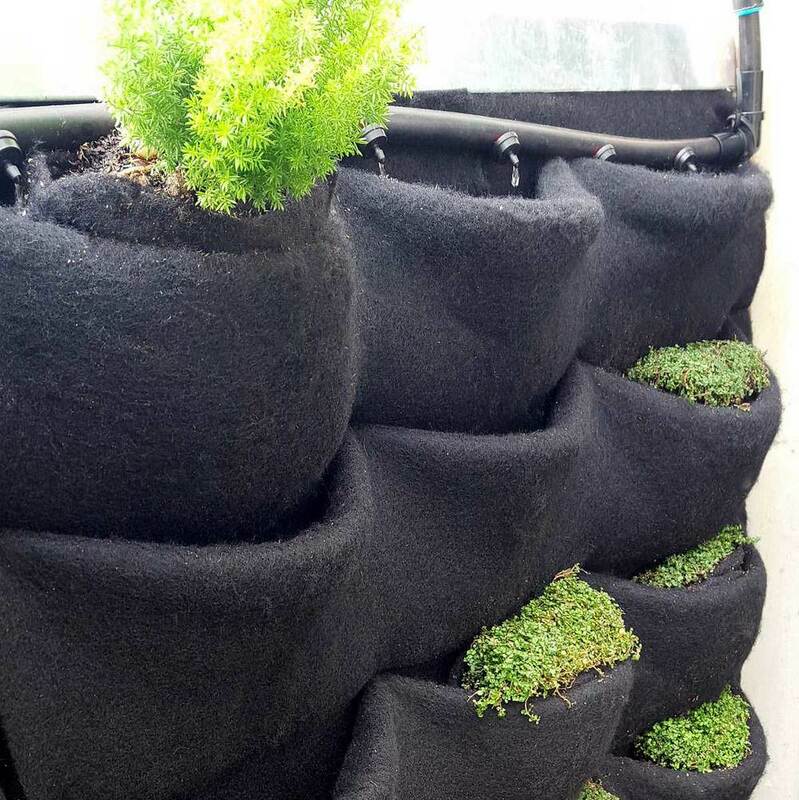 Florafelt Vertical Garden Planters come with a segment of 1/4" drip irrigation tubing that will work great for smaller installs. These are simply connected to your existing drip irrigation system or a digital hose timer with regulator and filter. If you're doing larger installs you might consider using the larger 3/4" irrigation tubing with 1/2 gallon/hour button drip emitters that are easy to change out if necessary. And be sure to keep the drip visible so you can see the water flowing. The larger tubing gives you unrestricted flow which means you can make longer runs from your source. 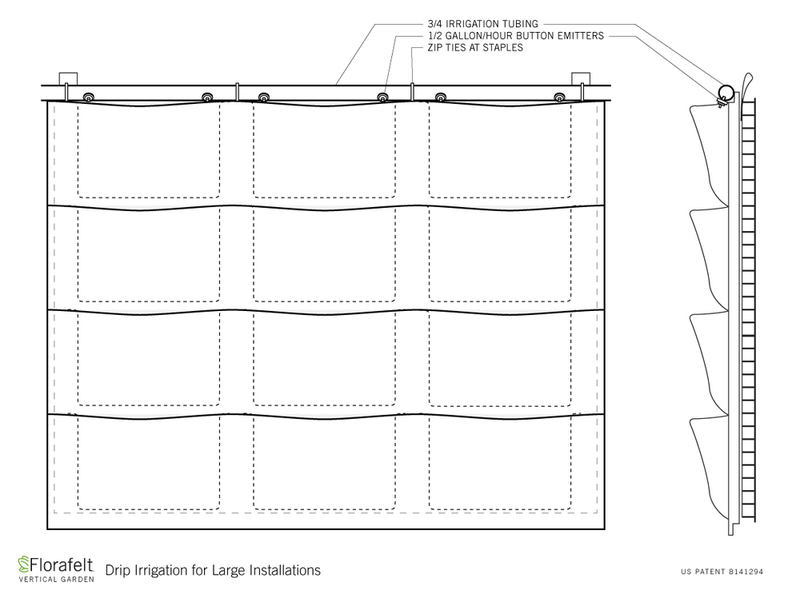 For even very tall walls its preferred to use a single irrigation run at the top row of pockets only. This makes maintenance much easier and reduces the flow of water to a slow trickle. This allows for the moisture to wick downward and sideways into the felt and allow for more time for it to absorb into each root wrapped plant. It's best to use two drip emitters for each pocket located at the far edges. This makes it easier to insert a plant into the top pocket and let's the drippers be free of blockage. Plus you can visually see the drippers working. It's not important to drip into the soil itself. The pleated felt system wicks water downward where water collects in the bottom fold of each pocket. Therefore you must wrap your plants wide and narrow so they will make contact with the bottom fold. Observe your new planting carefully to make sure each and every plant is absorbing moisture correctly. Use the diagram below to design your system. Save time and simply buy our ready-made Drip Irrigation Kit. It has all the parts you need to add a professional drip system to the top of your vertical garden. The timer, filter, regulator is pre-assembled and ready to go. A high quality garden hose can make a nice connect to a nearby hose spigot. You'll need to use a hose splitter so others don't remove the connection. Also use zip ties to show others that the vertical garden's water source is to 'remain on'. These battery operated timers are very reliable and easy to program and make adjustments. These nice grey ones are available at Home Depot. This will reduce water pressure down to 30psi which will prevent your drip emitter and connectors from blowing out. The mesh filter will prevent small particles from clogging the drip emitters. Be sure to check and clean the filter on a regular basis. You may need adapters to make connections between the timer and filter/regulator fittings. Note there is an important difference between 'hose thread' and 'pipe thread'. Also make note you will need Plumbers Tape to make pipe thread connections, but not required for hose thread connections. And be sure there is a hose washer present in your hose thread connections. The Orbit Digital Hose Timer is a simple and reliable way to keep you vertical garden wet. Because it's battery operated you won't have to worry about a blown fuse (typical for outdoor locations). Here's a super simple video showing how to program it. With Florafelt Systems the water must flow through the felt. It's possible to position your vertical garden over a planter below but in some situations you may not want water hanging around. 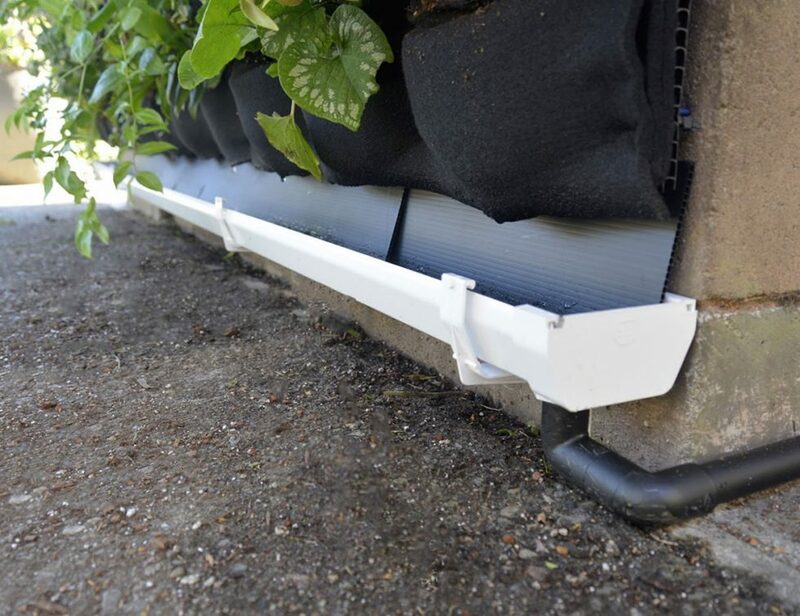 You can use off the shelf PVC plastic gutter systems to make an easy and low-cost drain tray system. 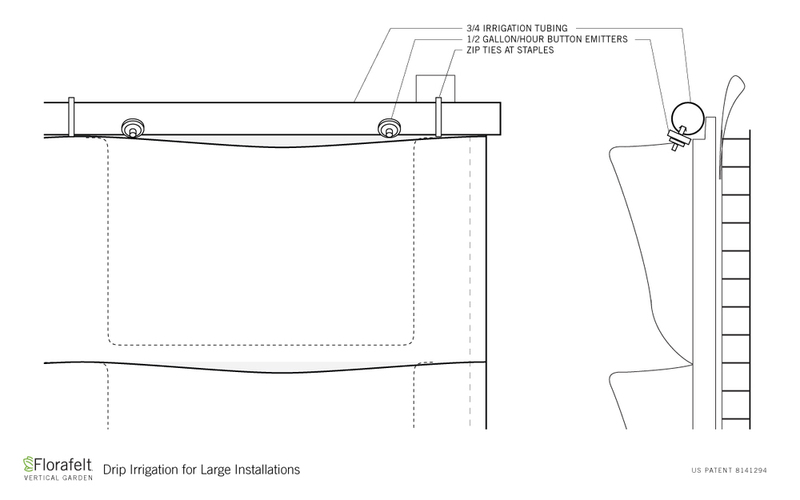 You can use the drain connectors that come with their system or you can use other fittings to make a low-profile drain-away system using 3/4" PVC pipe. Nylon Fittings can be siliconed into place, then loosely set into the PVC fittings which will allow for cleaning and won't break if bumped. West Marine has nylon fittings used for through hull connections. The one shown here fit's nicely into the 3/4" PVC elbow connector perfectly. Use Clear Silicone to make the watertight connection in the tray.